In contrast, the second most shorted stock, Cargojet, based on INK short signals, has a potential short-squeeze setup as short-sellers are betting against a stock with relatively high insider commitment as of report date. While insider commitment shows up as mixed on our outlook rankings in the table above, the commitment level was above average at month-end and remains that way, which is enough to call into question the short-selling case. The third most shorted stock, Paramount Resources, also has a potential short-squeeze setup based on our signals, suggesting the stock may be poised to break out of its current trading range to the upside. 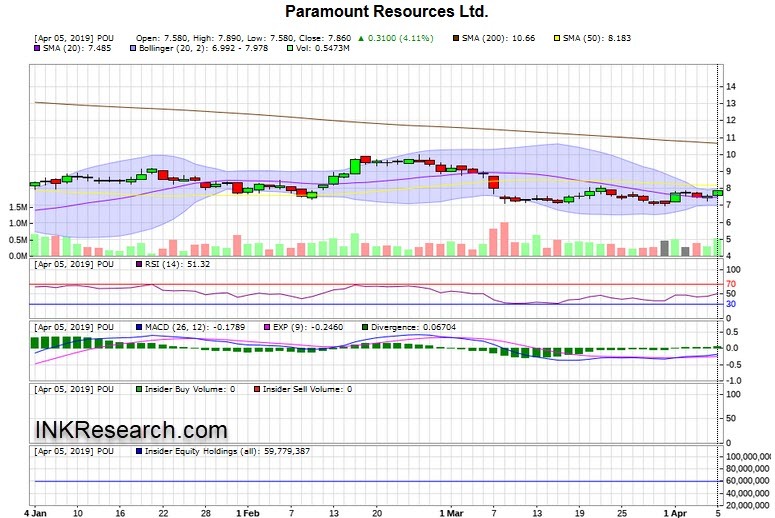 Will short covering help Paramount Resources breakout? With the stock up over 4% today and trying to overcome its 50-day moving average, it may be attempting that now. Meanwhile, shorts may be overstaying their welcome at Great-West Lifeco which is trading near its 52-week highs. Too much pessimism over low rates may still be priced into the stock. Based on our signals, a further short-squeeze is possible. Interestingly, we do not have a short signal for the 10th most shorted stock, EXFO as the insider commitment ranking is not high enough to suggest a short-squeeze is possible. On the other hand, we also do not have an insider commitment plus short positioning bearish combination either.